Metamark 7 Series is a premium grade polymeric calendered signmaking vinyl featuring a soft handle 70 micron face film, high grade permanent solvent based adhesive and a performance-tuned lay-flat liner. 7 Series offers excellent cutting and weeding performance and is easy to work with. Durability is 5 years for black and white and 5 years for colours. 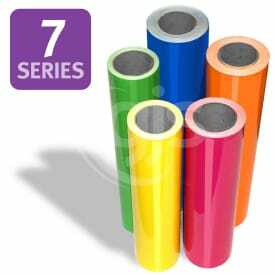 Metamark 7 Series is perfect for vehicle applications and window and outdoor graphics onto flat or curved surfaces. Colours shown are not a true representation - consult swatch book for accurate colour samples. I had been thinking long-term about the investment that I wanted to make in regards to apparel and how to get the best value for money. Michael from GJS was a huge help and knowledgable in the way to lead me through what was best, for both now and future growth. When the time comes to update I will be reaching out to the team to do so. I really can't speak highly enough of the team.